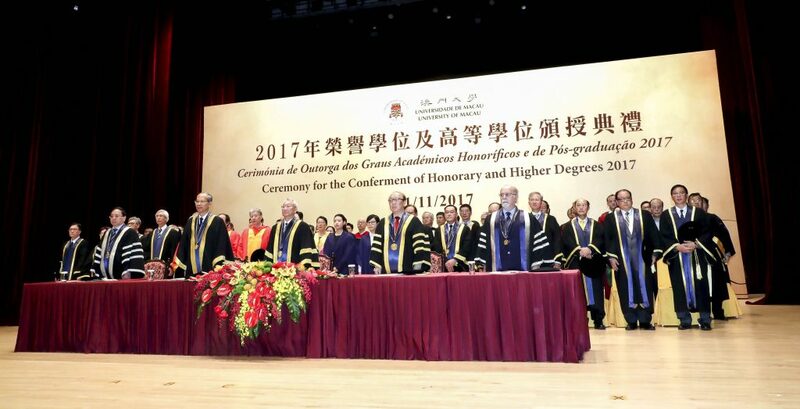 The University of Macau (UM) (11 November) held the Ceremony for the Conferment of Honorary and Higher Degrees 2017. 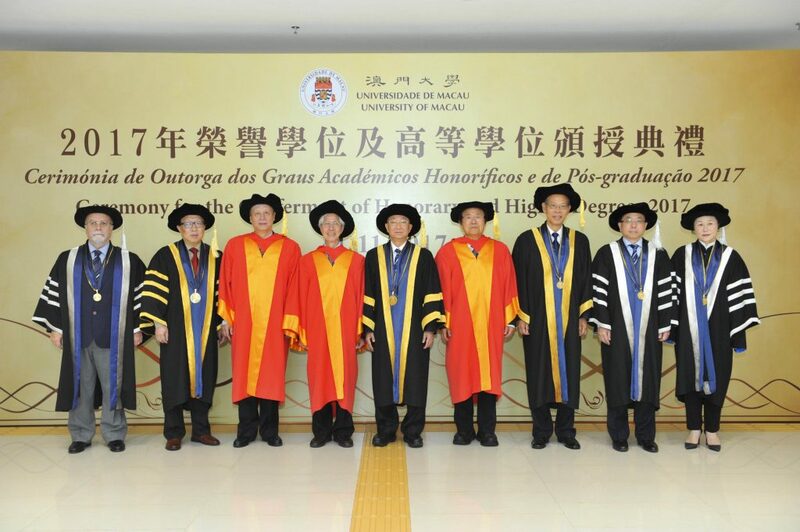 During the ceremony, the university conferred honorary doctorates on Academician He Jingtang, a representative figure in the Chinese school of architecture; Professor Henry T. Yang, a world-renowned expert in structural engineering; and Professor Binglin Zhong, a well-known educationalist, in recognition of their outstanding achievements and significant contributions to society and education. Prof Philip Chen, dean of the Faculty of Science and Technology, delivered a citation for Academician He Jingtang. Prof Chen said: ‘Chinese edifices and monuments form a prominent piece of world architectural mosaics. For that, we should be grateful to the strong architect corps that China has. And among them there shines an academician. A pivotal figure of the Lingnan school of architecture, Academician He has been working hard since the 60s of the last century to preserve and sustain traditional Chinese architecture. On the back of traditional Lingnan aesthetics, he formulated a theoretical system known as the ‘two concepts’ and ‘three characters’. Not only does his aesthetic thesis give a shot in the arm for the Lingnan school of architecture, but it also enables him to produce many of his masterpieces that are world-class, therefore putting Chinese architecture on the world map and inducting him into the pantheon of great architects. Off his drawing board is his brain child of the UM campus. His objectives were how to design a modern and technologically advanced campus that would be sustainable and exude an aura of humanism. Not least, he was thinking how it could be landscaped into a garden unto itself, and feature a collage of Chinese and western cultures. Thus he employed all of these concepts in his design and the result: the making of a campus as we know it: energy-efficient with a green and pleasant environment. He was crowned with China’s most prestigious architectural title–the first National Liang Sicheng Architecture Prize. His pièce de résistance, the China Pavilion for the Shanghai World Expo 2010, earned him the nickname of the ‘Father of the China Pavilion’. Prof Hong Gang Jin, dean of the Faculty of Arts and Humanities, delivered a citation for Professor Binglin Zhong. Prof Jin said: ‘It was in the rustic Yan’an that Professor Zhong cut his teaching teeth. In those difficult years, he learnt for the very first time what it took to be a teacher: the fortitude, the accommodativeness, the placidity, the heart. In spite of a hectic administrative schedule, Professor Zhong still stays committed as ever to research and teaching. He has also published his works extensively in world journals, featuring more than 100 papers in such academic journals as Educational Research, Journal of Higher Education, and China Higher Education. Professor Zhong stepped down as university head in 2012. So starting from 2001 and ending in 2012, he finished what is a perfect “twelve” in the sense of a “12-year” cycle according to Chinese Almanac. But it was stepping down; it was not stopping. It only meant that he would continue to contribute to education in another way: this time, he taught at Beijing Normal University and Tsinghua University. In the same year, he was elected president of the Chinese Society of Education, the position he has held since then.’ Prof Jin added that with a trajectory of educational and life experiences that span almost half a century, Professor Zhong has received slews of the tokens of appreciation and titles that bespeak his importance as a distinguished educationist. But for all those honorifics, perhaps for himself, no title is more important than that of a ‘teacher’.